TEHRAN - Venezuela's president joined with Iran's leader yesterday in boasting that they are "united like a single fist" in challenging American influence, saying the fall of the dollar is a sign that "the US empire is coming down." 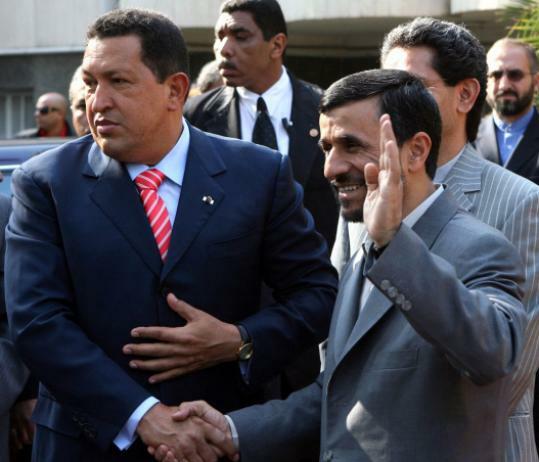 Hugo Chávez also joked about the most serious issue the United States is confronting regarding Iran - nuclear weapons - during his meeting with Iranian leader Mahmoud Ahmadinejad. The visit came after a failed attempt by the duo to move the Organization of the Petroleum Exporting Countries away from pricing its oil in dollars. OPEC's weekend summit displayed the limits of Chávez and Ahmadinejad's alliance - their proposal was overruled by other members, led by Saudi Arabia. But it also showed their potential for stirring up problems for the US and its allies. Making his fourth trip to Tehran in two years, Chávez has built a strong bond with Ahmadinejad that has produced a string of business agreements and a torrent of rhetoric presenting their two countries as an example of how smaller nations can stand up to the US. "Here are two brother countries, united like a single fist," Chávez said upon his arrival in Tehran, according to Venezuela's state-run Bolivarian News Agency. "God willing, with the fall of the dollar, the deviant US imperialism will fall as soon as possible, too," Chávez said after a two-hour closed meeting with Ahmadinejad, the Iranian state news agency IRNA reported. As the dollar weakens, oil prices have soared to $100 a barrel. Chávez said at the OPEC meeting in Riyadh, Saudi Arabia, that prices would more than double to $200 if the US attacked Iran or Venezuela. "The US empire is coming down," he told Venezuelan state television, calling the European Union's euro a better option and saying Latin American nations were also considering a common currency. The leftist leader is a harsh critic of President Bush, while Iran's government is in a standoff with Washington over Tehran's nuclear program. The US accuses Iran of seeking to develop nuclear weapons, which Tehran denies, and Iran has been hit with two rounds of UN sanctions for refusing to suspend uranium enrichment. Although it is a sensitive issue for his ally, Chávez joked about acquiring his own atomic bombs, apparently seeking to poke fun at the US accusation that Iran is using its nuclear program as a cover to develop nuclear weapons. According to a Venezuelan state TV report, when a reporter asked about the aims of his visit, Chávez said: "As the imperialist press says, I came to look for an atomic bomb, and I've got it here. If anyone should cross me, I'll fire it." Ahmadinejad did not appear to offer any reaction to the joke when he spoke later. Chávez has strongly supported Iran's right to have a civilian nuclear program, backing the position of Tehran that its atomic activities are intended solely for the peaceful production of electricity. "Iran has a right to have nuclear energy for peaceful uses," Chávez said.